Its wave-like design aims to blend in with the coast in front and the hills behind, incorporates three heated swimming pools, a viewing platform with a vista of Deep Bay, and an environmental education centre, and will produce enough energy to meet its needs and also power 3,000 homes. 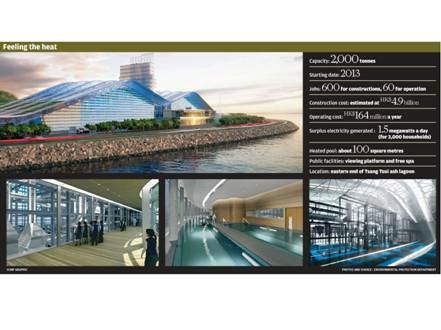 Yet all these attractive features cannot disguise the fact a HK$4.9 billion facility in Tuen Mun is merely an incinerator for processing sludge from sewage treatment plants. Needless to say, it has not won over local politicians, who staunchly oppose any idea of building a solid-waste incinerator beside it. Tuen Mun district councillors consulted about the sludge plant’s design said it would be the last unpopular facility they would accept. Councillor Lothar Lee Hung-sham said the leisure and education facilities were a gimmick to woo Tuen Mun residents into accepting further waste incineration facilities. “Why do we need such heated pools or an education centre? We don’t need to be educated about incineration if such a facility does not exist here in the first place,” he said. The government has not ruled out seeking approval for a proposed solid waste incinerator next to the sludge incinerator in Tuen Mun, or on outlying island Shek Kwu Chau. Yet Lee said the council strongly opposed any more polluting facilities in Tuen Mun as the district already had two power stations, a cement-making plant, steel-mill, landfill and an aviation fuel storage. Chan Shue-ying, another councillor, said the sludge plant was not opposed as they hoped it would be the final facility. Such opposition will be a blow to officials who had hoped the extra facilities would win public acceptance of thermal waste treatment. The government unveiled details yesterday as it announced it had awarded a contract to design, build and operate the plant to VW-VES Hong Kong, a subsidiary of French environmental giant Veolia. The burning chamber will be hidden behind glass exterior walls with the 50-metre stacks barely visible from outside. To allay fears over emissions, the Environmental Protection Department has also agreed to set up a new air-quality monitoring station in Tuen Mun to closely track air pollution in the area, but its exact location has not been decided. The incinerator, at the northern end of the Tsang Tsui ash lagoon, is environment officials’ long-awaited solution for treating the foul-smelling sludge now dumped in landfill sites. Able to handle 2,000 tonnes of sludge a day, the facility will take all of the 800 tonnes now produced each day, which is expected to grow to 1,500 tonnes in 2014. Officials have blamed the undesirable practice of burying the sludge in landfills for creating a bad smell affecting Tseung Kwan O residents. With incineration, the landfills will take only the burnt residue. Edward Yau Tang-wah, the environment secretary, hailed the plan, saying it would incorporate the latest incineration technology and meet the most stringent emission standards in the world. “The project shows modern technology can offer a much better solution and also provide facilities that will be popular with the local community,” he said after a ceremony to sign the contracts. The control of these factors is essential. Temperature. The higher the temperature the more effective the incineration and the lower the possibility of any unburned waste being released or hazardous by-product being formed. Temperatures of 900 – 1100°C will destruct hydrocarbon waste. Temperatures of 1100 to 1300°C are needed for chlorinated solvents and other wastes which are difficult to incinerate. Temps over 1200°C are needed for bond breakup. At temperatures below 900°C hazardous by products can be formed these include dioxins and dibenzofurans. At temperatures below 800°C incomplete combustion is likely to occur and soot formation will result. Residence time. It is necessary to hold the waste at high temperatures for sufficient time to ensure destruction. The longer the material is held at high temperature the more likely it is to be destroyed. The residence time for gaseous substances is a minimum of 2 seconds. For solids the residence time could be minutes or even hours. Turbulence enables waste and air to be well mixed. Turbulence should be maximized so that contact between the waste and the oxygen In air Is as high as possible. Excess oxygen must be present to ensure that the oxidative processes predominate and the pyrolytic processes are minimized. Generally oxygen should be present at 50-100% higher concentration than is theoretically required to decompose the waste. Win = concentration of that compound in the waste feed x volumetric flow rate of stack gas. This procedure is used to assess the efficiency of high temperature incinerators and is often applied to the more difficult wastes such as PCBs – if these are being adequately destroyed then all other combustible materials in the feed will also be destroyed. The latest high temperature incinerators achieve DREs of 99.9999% of PCBs. Check delivery against customer description. Tank farm – bunded. Flame proof pumps, maintenance of valves, glands etc. Drum compound – wastes segregated and separated. Flame proof fork lift trucks. All drains taken through oil interceptors. Bulk waste stored in bunded cells. Special handling areas – eg for PBCs/transformers. Multi waste capability – liquids, drummed solids, bulk solids. Long solids residence time. Continuous operation – loading and ash out. Flexible operation – variable rotation speed. Excellent for burn out of large objects – eg transformers and contaminated equipment. Long residence times for drummed wastes. Long gas phase residence times possible. Continuous loading and ash out, so attractive br commercial applications. Used for Clinical waste – good control over agitation of high ash wastes. Cheaper to build than rotary kiln – lower intrinsic particulates emissions. Severe problems with early moving grate types. The most common type for small installations – often manual loading and ashing out – typical of small hospital incinerators. No agitation of waste, so easy to create pockets of unburned refuse -the “baked alaska” effect. Older units commonly have no emission control equipment, inadequate afterburner. Often used for sewage sludge also plastics and pharmaceutical industry wastes. Cylindrical vessel containing an inert bed of granular material which is fluidised by an air feed. Waste is pumped into or above the bed. Simple design and low capital costs. Good combustion efficiency. But operating costs relatively high and not suitable for irregular, bulky or tarry washes. 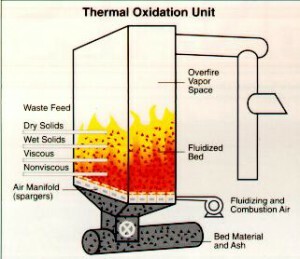 Figure 1 shows a general diagram of a fluidised bed incinerator. The suitability of the different types of incinerator systems for different types of wastes is summarised in Table 2. All Incinerators produce emissions, these fall into two basic categories. Gas phase emissions from hazardous waste incinerators comprise carbon dioxide, water, excess air, oxides of nitrogen, sulphur and phosphorous and halogen acids. The major problem from an atmospheric emissions viewpoint are the acidic gases: – Sulphur dioxide and hydrochloric acid. These are the products of incineration of sulphur containing and chlorinated compounds respectively. Both gases are water soluble and can thus be removed from the effluent gas stream with water sprays – a number of strategies exist to accomplish this. On dissolving these gases produce an acidic solution which needs to be neutralised normally prior to sewer discharge. This neutralisation step is usually made easier by using alkaline solutions in the water sprays. This has the further advantage of increasing the scrubbing efficiency of such a system. Particulate emissions are very different in nature, they comprise solid particles of either unburned feed materials or ash formed in the incinerator and can also be removed by a number of methods. The cleaned gases are cool and do not possess the kinetic energy required to pass up the stack for atmospheric discharge, consequently an induced draught fan and/or reheat facilities are usually deployed. Gases leave the afterburner at 1100 to 1 200C – there is considerable potential for heat recovery. Recovered heat can be used to reheat a wet plume, so making it invisible. Recovered heat can be used for power generation, partly reclaiming fuel costs. Corrosion is the big problem associated with heat recovery. Comprehensive plant condition monitoring covers temperature measurement at all critical points in the system, measurement of oxygen levels, and measurement of main discharge consent parameters, usually on a real time basis. Operating plant at peak efficiency, and maximising return on investment. Providing proof of compliance with conditions of authorisation. Providing customers with evidence of satisfactory waste disposal. Using waste of one type or another to supply useful energy is a well established method of obtaining added value before final disposal. This will be especially important where final disposal options become more limited and in situations where environmental and economic costs (including collection and transport) of recycling are high and where the pratical optimum for materials recovery has been reached. For example, if 25% recycling of MSW is reached, that leaves some 75% , which in some cases, can be used for energy recovery. controlled anaerobic digestion as at many sewage treatment works. Of these, energy from landfills and sewage sludge digestion are the most important sources of energy from waste. For example, Luggage Point STW in Brisbane, and Roghan Rd Landfill in Brisbane where approximately 600m3 of gas per hour is being collected. What are the advantages and disadvantages of energy recovery from incineration? incineration significantly reduces, but does not eliminate, the volume of material to be disposed. Incineration, even incineration for energy recovery is not popular in Australia. There are probably historical reasons for this, as there has always appeared to be plenty of land available for landfill, though interestingly there have been municipal waste disposal incinerators in some smaller cities. For example, Burley-Griffin, the architect responsible for designing Australia’s capital Canberra designed and built incinerators in the early 1900’s. Two of them to my knowledge have been converted into theatres for staging plays. The real problem of incineration has been with the destruction of hazardous wastes, or as they are now known as scheduled wastes. These include PCBs, HCB, other chlorinated hydrocarbons and organochlorine pesticides. These are wastes which are organic, resist degradation, are toxic, and accumulate. Historically these wastes were exported to the Rechem incinerator in Pontypool, or disposed of by the floating incinerator Vulcanus. The Vulcanus last visited Australia in 1982 and the Minister for the Environment stopped the export of hazardous wastes in June 1994. Interestingly there is still the export of a potentially hazardous waste – photographical laboratory chemicals which go to Thailand where the silver is extracted. With exports stopped the only thing to do was store them. Currently there are an estimated 100 000 tonnes of scheduled waste stored in Australia awaiting disposal. This includes 8000 tonnes of HCB at one site near Botany Bay. It does not include 45 000tonnes of soil contaminated with 100tonnes of HCB buried under a car park, nor does it include an unestimated but rumoured amount of soil in rural areas which were once cattle dips and contain DDT and arsenic – sometimes at quite high levels. The investigation level for arsenic in garden soil is 10mg/kg. We have some parcels of soil with over 150 000mg/kg. These are very few, but in some cases have residences built on them. Because incinerators are not to be used, this has led to the development of new technologies. Three which have been started in Australia – the Eco Logical hydrogenation process, base catalysed dechlorination (BCD), and plasma arc conversion. The Eco Logic process was developed in Canada, and a $2million (£1million) plant has been established in Western Australia. The process involves the treatment of gaseous or liquid wastes in a reactor at 850°C in a hydrogen atmosphere. The halogens are displaced producing a mixture of methane, hydrocarbons and hydrogen chloride. The HCl is removed by scrubbers and the hydrocarbons are burned with the heat used to preheat the waste stream.There first job was to treat 200tonnes of agricultural chemicals, mainly DDT. The capacity of the plant is about 30tonnes per day of high strength PCB and pesticide wastes. The plant can be moved from site to site so is useful for transporting to the wastes, thus eliminating the problems of transporting contaminated wastes. The Plascon process was developed in Australia by the CSIRO and a private firm. The process an arc of ionised argon gas at 15,000°C which goes into a reaction zone at 5,000°C. The waste is injected into this and pyrolisis occurs within about 20 milliseconds splitting the compounds into atoms and ions. The stream of gas, now at about 2,000°C is rapidly quenchd to ambient temeratures to prevent recombination into complex molecules. The gas stream is scrubbed and the remainder, mainly CO and H2 is flared. Trials on a mixture of 34% chlorophenols, 47% phenoxies and 19% toluene resulted in very low stack gas emissions. The chlorophenols were about 1mg/m3 and dioxins/furans 0.006 – 0.009 ng/m3 – less than one tenth the limits enacted in Germany in 1990 for incinerator emissions of 0.1ng/m3. The plant cost about $900,000 or £450,000, and can handle about 1 tonne per day. Trails have been carried out on full strength PCBs, CFCs and similar compounds. The plant is portable, and a second plant has been completed. Given that these plants operate at or near capacity, then a quick calculation shows that one plant each of the three systems will treat about 37tonnes of waste per day. Given Australia’s stockpile of 100,000tonnes that means there is at least 7 years work ahead, but this does not include the contaminated soils, nor any new wastes being produced. 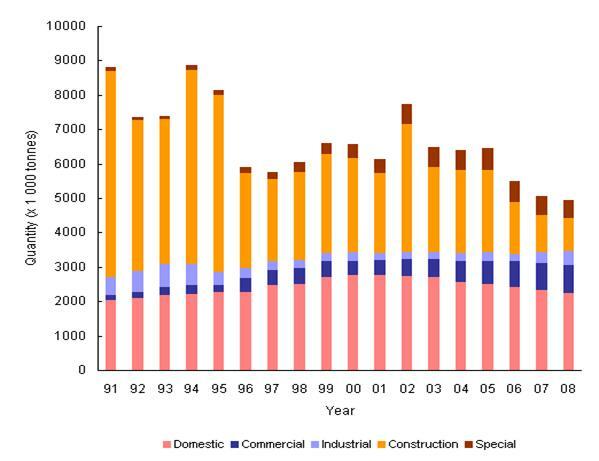 Incineration of wastes is not used in Australia nearly as much as overseas. This is partly historical because of the large expanses of land (apparently) available for landfills. However, with increasing pressure on land and the potential for energy recovery it could b a developing technology in Australia. The development of a high temperature incinerator for disposal of intractable wastes is highly unlikely, especially given the development of new technologies in Australia. Five incinerators – one in each of the Legislative Council’s geographical constituencies – should be built to handle the city’s daily load of 10,000 tonnes of rubbish, not just the two proposed. That is among recommendations in a Baptist University study, released yesterday, into use of incineration to rid the city of its solid waste. The report cites European and Asian economies where incineration is a popular and effective form of waste disposal, and says it is especially suitable for such densely populated cities as Hong Kong. In Japan, three-quarters of solid waste is burned, and only 1.7 per cent goes to landfills, says the report by the university’s Advanced Institute for Contemporary China Studies. It cites Tokyo as an example and says there is an incinerator in each of its districts. The report acknowledges that many people in Hong Kong still consider incineration an unclean way of handling rubbish, but it says technological advancements have made incineration a clean and effective method of waste disposal. One advantage, the report says, is that incinerators can also generate electricity. It cites Macau, where the local incinerator can generate sufficient electricity for 33,000 families. In Germany, 75 incinerators handle 18 million tonnes of rubbish a year and provide job opportunities for about 60,000 people. Public concerns about disposal of rubbish have mounted since a government move to expand the landfill in Tseung Kwan O was voted down by the legislature. Environment officials have warned that the city’s three landfills will soon be full and other ways of handling the rubbish need to be explored. Hong Kong’s daily production of municipal solid waste grew from 8,600 tonnes in 2000 to about 9,800 tonnes last year. At present, about half is recycled and the rest is sent to the three landfills. Association Between Fine Particulate Matter and Diabetes Prevalence in the U.S.
were collected from the U.S. Census Bureau and the CDC. levels of PM2.5, an association that persisted after controlling for diabetes risk factors. is a risk factor for diabetes. OBJECTIVE— Recent studies have drawn attention to the adverse effects of ambient airpollutants such as particulate matter 2.5 (PM2.5) on human health. We evaluated the associationbetween PM2.5 exposure and diabetes prevalence in the U.S. and explored factors that mayinfluence this relationship.RESEARCH DESIGN AND METHODS— The relationship between PM2.5 levels anddiagnosed diabetes prevalence in the U.S. was assessed by multivariate regression models at thecounty level using data obtained from both the Centers for Disease Control and Prevention(CDC) and U.S. Environmental Protection Agency (EPA) for years 2004 and 2005. Covariatesincluding obesity rates, population density, ethnicity, income, education, and health insurancewere collected from the U.S. Census Bureau and the CDC.RESULTS— Diabetes prevalence increases with increasing PM2.5 concentrations, with a 1%increase in diabetes prevalence seen with a 10 g/m3 increase in PM2.5 exposure (2004:  0.77 [95% CI 0.39 –1.25], P0.001; 2005:0.81 [0.48 –1.07], P0.001). This finding wasconfirmed for each study year in both univariate and multivariate models. The relationshipremained consistent and significant when different estimates of PM2.5 exposure were used. Evenfor counties within guidelines for EPA PM2.5 exposure limits, those with the highest exposureshowed a 20% increase in diabetes prevalence compared with that for those with the lowestlevels of PM2.5, an association that persisted after controlling for diabetes risk factors.CONCLUSIONS— Our results suggest PM2.5 may contribute to increased diabetes prevalencein the adult U.S. population. These findings add to the growing evidence that air pollutionis a risk factor for diabetes. Department of Community Medicine, School of Public Health, University of Hong Kong. Everyone working in the environmental health field would want to support and promote, by any means, a strategy for eliminating pollution and protecting population health. However there are fundamental problems with the government’s current proposals for initiating this process and it is vital that the deficiencies in this are fully externalised and open to public debate. I suggest that the government’s consultation document on the state of Hong Kong’s air quality and its detrimental effect on population health conceals more than it reveals about this enormous environmental hazard. The government document is misleading, disingenuous and lacks transparency and does not provide the public with an unbiased assessment of the choices which it is being asked to make. I have attempted to address a few of the relevant issues using the items in the government consultation questionnaire as prompts. Q1. Do you agree that the existing Air Quality Objectives (AQOs) need updating? The Hong Kong AQOs have needed updating for more than a decade. Environmental experts have strongly argued for this over more than a decade. In 1998 a team of academics from two universities worked pro bono to produce a new set of proposed AQOs on the basis of local scientific evidence on the harm of air pollution to children and adults. The professionals knew, at that time, that this was an urgently needed step in air quality management. The report produced at that time was sent for external overseas review but neither the report or its evaluation were placed in the public domain and its contents have never been discussed in the context of Hong Kong’s air quality management. In addressing the current consultation document it is not clear how the general public can answer this technical question in an informed way without appropriate independently formulated and detailed explanatory information. Sensing that the answer to Question 1 is inevitably “yes” I imagine that the majority of respondents will affirm that if the solution to this problem is a new set of environmental regulations then they should be implemented. However for years the government has used the existing outdated and lax AQOs as a defence against criticism of deteriorating air quality and that attitude does not augur well for the future given the problems which we will explore with the new proposed AQOs. Why has this professional arm of government lost its most senior professional posts? While the AQOs and the legislative process will determine what policy is adopted and incorporated in legislation, the government, Legco and the public need and deserve an intellectually valid and professional analysis of our environmental status and management choices. To what extent has air quality management and this public debate been compromised by an EPD which has been de-professionalised at its senior management level? I believe that the Hong Kong public is now paying a heavy price for the lack of a professional environmental health protection agency. There is apparently a complete absence of any official expert public health input to risk assessment, audit, evaluation or accountability procedures in Hong Kong’s air quality management. The health authorities have no defined role in this area of health protection .There is no public health report in either of the annual departmental statements by the Director of Environmental Protection or the Director of Health, which explicitly document the attributable harm to health and the burden on health services resulting from air pollution in each year. It is notable that the present government report which is the basis of the consultation does not quote a single statistic from the many academic papers published on the pollution induced damage to Hong Kong’s public health over 20 years. The bad health outcomes of air pollution which include impaired lung function in young children, an epidemic of respiratory symptoms in both children and adults, increased doctor visits, hospital admissions and deaths from heart and lung disease and strokes should presented in a way which emphasises that they are avoidable through competent management of the environment. This should be the explicit and plainly worded starting point of the consultation rather than bureaucratic statements from administrative officers. In addition to any revision of our air quality standards a detailed annual accountability report should from now on be produced jointly by the EPD and DH to demonstrate the extent to which the government is effectively addressing this regional environmental disaster. These reports should be subject to independent external audit. While we urgently need revision of the current AQOs the government has failed to demonstrate how any new air quality interventions will be implemented, monitored and evaluated with the necessary expertise on an appropriate timescale. Did we need an outside consultant to modify the AQOs? at least, and by now could have been at a much more advanced stage of consensus. There is ample expertise within the remaining professional officers of the EPD, academic and other environmental NGOs to have addressed this issue and formulated an evidence-based strategy which could then have been the basis of discussion with all interested parties. In the meantime I am concerned that the consultancy and the proposed AQOs will apparently be used as a new instrument for procrastination without proper regard for the continuing medical and health impacts on our community. Q2. Do you agree that the AQOs should be set with reference to the guidelines and interim targets (ITs) published by the World Health Organisation and that a staged approach be adopted to update the AQOs with a view to achieving the WHO Air Quality Guidelines (AQGs) as a long term goal? This is probably the most disingenuous question in the consultation. Here the government is trying to set the agenda with a tendentious form of words. The general public should, for public health reasons, firmly answer “NO” to this question. First, there is no reason why the WHO AQGs should not be adopted as the new HK AQOs. If they were we could then begin to discuss the process of effective exposure reduction towards the AQG and the timescales which are appropriate. The term “with reference to the guidelines & etc” is a mechanism for pretending that our new AQOs are based on the collective global scientific evidence which underpin the AQGs, without actually having to adopt them and then deal with the vested interests who would require to clean up transportation, power generation and manufacturing. Under Question 4 below I explain why all but one of the proposed AQOs do not match either ITs or AQGs in the WHO report. The term “a staged approach” almost certainly means that once the new but unsatisfactory AQOs are enshrined in the Air Pollution Control Ordinance the government will have total control over compliance and timescales and any leverage for accountably by the public will be reduced or lost. The adoption of these permissive modified AQGs as AQOs will impede our progress towards exposure reduction because under the ordinance these single limit values will effectively block the process of continuous reduction of ambient pollution and the health gains which follow from them. Such a prescriptive policy by government will directly damage children’s lungs. The government’s phrase “long term goal” is particularly threatening to public health. This is a euphemistic way of the government saying that population health, including the future life-time health of children can and will be traded off in favour of other interests over an indeterminate period. That choice is one which should be made by an informed public and should be at the forefront of this consultation. It must be remembered that although the full WHO AQGs are single limit values there is no suggestion that they demarcate the boundary between safe and unsafe air. Adverse health effects have already been demonstrated at levels well below the AQGs. These values can only be regarded as a maximum acceptable level of pollutants and even lower levels should be regarded as desirable targets. their entirety as legal standards”. We need to recognise that we are not dealing with other jurisdictions; we are, or should be, trying to address an environmental disaster here in Hong Kong. The most salient fact is that there is probably no other country or region with a comparable level of social, economic and technical development which has allowed a comparable level of poor air quality to develop without taking effective counter measures. Other countries clearly intend to address the revision of their air quality standards and will likely adopt measures which are much more radical than the current standards. Countries within the European Union which fail to comply with the Union’s targets are subject to legal action. The United Kingdom is one of them. In addition and quite apart from the serious health consequences of this attempt to deny the need for urgent action in the consultation process, the government offers a strange response to a ubiquitous problem which threatens the economy, degradation of urban fabric and the aesthetic attractions of Hong Kong as a global destination. One would have expected that pride in the city would have trumped any arguments for a laissez-faire approach. The world-wide adverse publicity arising from the problems of “Asia’s World City”, in the international media in every developed country, is a signal that those in charge of sustaining our environment need to review their priorities. The government’s arguments that the WHO AQGs are “far tougher” than other national standards, should be set against the fact that the government allowed Hong Kong’s air quality to deteriorate very rapidly over a decade or so and exceed even lax outdated AQOs. Taken together with the views expressed in the consultation document this does not inspire confidence that we are about to see a change in political will and competent environmental management. The diplomatic language of the WHO report should not be used as a reason or excuse to introduce ineffective measures and delay the attainment of urgently needed health protection for children. The WHO as an agency of the United Nations observes neutrality and sensitivity in its dealings with member countries of the World Health Assembly. Its relatively permissive statements on levels and timescales of pollution abatement are designed to accommodate poor marginalised territories which would not have a hope of implementing the full AQGs in the near term. However for the HKSAR government to use this particular terminology as an excuse and a mechanism for delaying progress towards cleaner air amounts to a shameful solecism. In particular it is not a public health approach. In its approach to defining the new proposed AQOs the consultant and the government have not adequately addressed the issue of exposure reduction. A major obstacle to this is the very high level of roadside pollution across urban Hong Kong. The diurnal variations in roadside pollutants, particularly PM10 and NO2 point to local sources as the major and avoidable hazards. Table 4.1 in the government consultation document clearly demonstrates that our extremely high levels of NO2 are generated solely within Hong Kong. Pollution abatement at the roadside is well within government control on a short timescale, given the necessary political will. The implementation of transport emission controls has taken far too long, is based on volunteerism and fails to take a comprehensive approach to identified problems. Until the government takes charge of this situation and ensures that effective mandatory measures are fully complied with we will continue to have dangerously high roadside pollution in Hong Kong. We have shown that this affects at least half the population on a daily basis and the exposure prevalence is probably very much higher. Q4. Do you agree to the proposed new AQOs which have been set with reference to a combination of WHO AQGs and ITs? The answer to this question must be “NO”, given that only one of the AQOs is consistent with any of the AQGs or ITs. This will be a probably be a surprise to the majority of respondents to the consultation but there is no doubt that the proposed measures have been modified in a way which will predictably prevent the necessary improvements being achieved on an acceptable timescale and will prevent the achievement of the only AQO consistent with WHO criteria which is for Nitrogen Dioxide. The problem is that the government proposes that a variable number of “exceedances” should be permitted. These violations of the AQO (or supposed WHO criteria) have been informally argued by government officials as “unimportant”. This in turn raises the question as to why they are considered by government to be necessary. A formal decision analysis approach using a range of statistical methods shows that if these exceedances are allowed as part of the new Ordinance then improvements in air quality will be delayed or air quality may actually deteriorate further and the targets will not be achieved. Further deterioration in control of SO2 emissions and ambient concentration is a particularly serious potential outcome. All of this will be protected by the new law. We have documented and illustrated these phenomena in a separate report to Legco and the EPD. In this respect the government’s report must be regarded as a major deception in terms of its misrepresentation of the WHO IT and AQG. Table 5 of the government consultation report makes no mention whatever of the introduction of exceedances. This arbitrary modification of the WHO Guidelines may (and probably will) have a profound effect on the degradation of air quality and the health effects which result from it. The proposed AQOs cannot in any sense be legitimately described as “benchmarked” to the WHO recommendations. The process by which the consultants and government came to contrive this modification of the WHO guidelines should be fully externalised and examined in detail because it appears to indicate that government is seeking to establish Objectives which can accommodate the present highly polluted environment rather than remove it. Q5. Do you agree that a mechanism should be put in place to regularly review the AQOs no less than every five years? A qualified “YES” in principle would be appropriate here but the suggested term of 5 years is quite unacceptable. The regional health hazard of pollution should be the subject of continuous and detailed monitoring and appraisal. An annual report (jointly between the EPD and DH and other expert groups) on the extent to which identified trends are consistent with stated goals, and the attributable health consequences of those trends, is necessary to maintain the required high profile of this problem and the priority which it demands. No argument is presented by government to support the suggestion of a five year interval. Government reviews can be notoriously prolonged and the post review period of assessment adds to the timescale. A five year review could easily lead to seven year intervals between any possible action on failing strategies. We need an annual review of this all pervading threat to the health of the community. The nature and magnitude of this problem fully justifies the resources needed for this task. Q6. To what extent do you agree that the proposed emission control measures should be implemented for achieving the new AQOs and improving air quality in general? What other measures do you think the government should consider? Many NGOs, academics and other environmental interest groups have made well founded suggestions for comprehensive emission controls. These must embrace infrastructure developments, traffic, air and marine navigation and power generation. We need urgent mandatory action on all of these. We also need to see how powerful vested interests, especially those concerned with regional development are going to be dealt with. Many of these developments such as bridges over the Pearl River Delta are already a foregone conclusion, even before environmental impact assessment (EIA) reports are available. EIAs must now include the attributable population illness and premature deaths which will result from these developments under different projections of emission controls and their violations. We need a radical change of outlook here. For example the previously mentioned problem of volunteerism must be addressed. Polluters are harming others and rigorous control is part of the government’s duty of care. The costs of subsidies should be set against the ongoing community costs of pollution induced health problems and lost productivity, now and in the future. Seven or more years to convert Hong Kong’s taxi and mini-bus fleets was far too long and a proper accountability mechanism would show the public the consequences of that in human terms. My present view of many of the proposals for emission controls is that they are too vague to be adequately assessed in health outcome terms, the timescales are uncertain and many appear to be gratuitous “over the horizon” suggestions which may join the long litany of proposals which have been raised without effect for thirty years or more, such as electronic road pricing or pedestrianisation of streets. Proposals for emission controls are vague, lack fail-safe implementation methods and timescales. Q7. How soon do you think these proposed emission control measures should be implemented? We require major emission reductions, especially at street level, immediately. In particular the government’s failure to sell the idea of conversion to higher Euro specifications for commercial vehicles must be fully resolved within the next 12 months. There is no justification for any continuing delay on this matter and it stands as a litmus test of the government’s commitment to protect public health. If we cannot achieve a clean up of the commercial trucking industry, given the funds and the technology, then air quality strategies in general are doomed to fail. There is no reason why the government should not have implemented effective measures a long time ago. The Chief Executive promised a 4 year programme in 1999. Why is the government still asking the public how soon they want the damage to heart and lungs to cease? Q8. Are you willing to bear the costs arising from the implementation of the proposed emission control measures, such as higher electricity tariff and bus fares, as well as adjustments in your way of living? All properly informed members of the public would want to answer YES to this question. This question is worded in a way that appears to suggest to members of the public that the only consequence for them, which will follow from the achievement of cleaner air, is a higher cost of living. This question should have been put clearly in the context of the community burden arising from our current direct, indirect and intangible costs associated with illness, health care, lost time at school and work, loss of quality adjusted life years and premature deaths. At present that amounts very conservatively to about $20 billion a year. In that sense we are living well beyond our means to the detriment of mainly the most vulnerable and deprived members of the community who experience the worst effects of pollution including higher mortality. Given the enormous social inequity created by pollution there are good arguments for funding the investment and ongoing costs from existing government revenue. We have not yet seen from the consultant or government any comprehensive assessment of the health impacts of the proposed new AQOs. The analysis of benefits is limited in its scope and does not fully explore the cost-effectiveness of air pollution abatement for the Hong Kong population. At an earlier public forum in Kowloon the consultants on the platform panel stated that (words to the effect) “this issue has been dealt with by the academics”. A $6 million consultation should have focussed on this as the key issue and provided government with fully documented tools to assess the community benefits of clean air. Why did this not happen? As a result the public is not presented with informed and realistic choices. There are many unanswered questions about the methods used to discount the costs and benefits in the consultant’s report. In particular, have they discounted future health benefits for children? The public should know the answer to this before they answer Question 7 of the consultation questionnaire. Q9. Do you have any other views on the Review? Quality of life in Hong Kong for many decades in the future will be determined by the effectiveness of government action now on the management of our environment.